K9 Raven is a german shepherd certified in airscent and human remains detection. 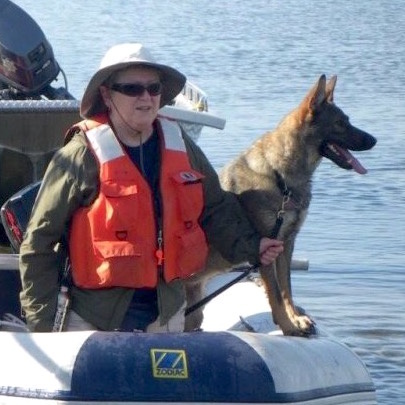 Marcia is a founder of King County Search Dogs has been involved in volunteer search dog work since 1972. She was a founding member of the American Rescue Dog Association and the Texas Unit of ARDA. She is a founding member of Northwest Disaster Search Dogs and a past member of Region 10 DMORT task force. She is the past chair of the National Association for Search and Rescue search dog committee. Marcia’s search dog experience ranges from disaster search (Wichita Falls, TX tornado; KAL Air Crash, Guam; Bremerton Fire, WA; Hurricane Katrina, MS) to wilderness, snow, water, and cadaver. She has also trained all her search dogs in trailing. Marcia’s dogs have made finds in trailing, wilderness, water, cadaver and disaster searches. She worked for DMORT at 9-11 Twin Towers (without dog). She had law enforcement experience as a Mt. Rainier National Park ranger. As a former high school and adult education instructor, Marcia’s interests are in teaching and writing. She has taken animal behavior (chicken training) classes that she incorporates into search dog classes. She has taught at NASAR and numerous training schools, seminars and workshops. She is the author of many articles and has produced a video tape on utilizing dogs for water search.